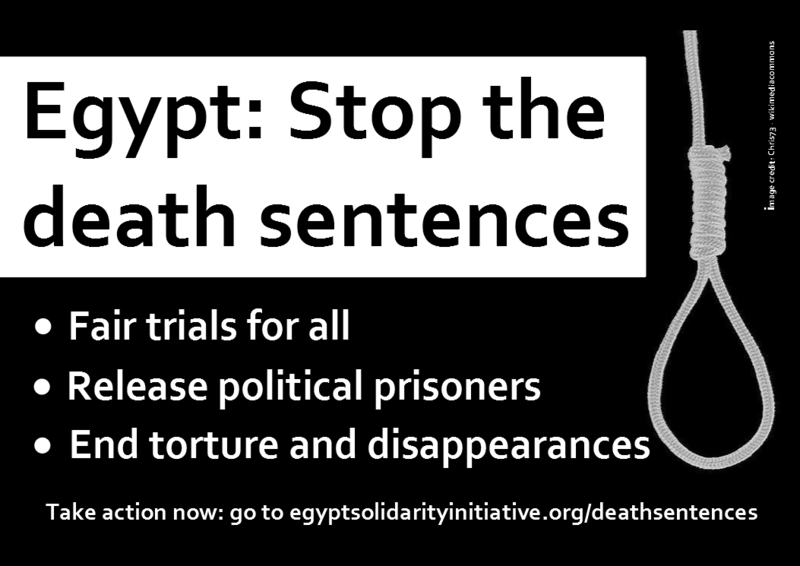 Following the confirmation of death sentences against 183 people by Egyptian courts on 21 June, we publish an English translation of a statement signed by hundreds of Egyptian activists calling for the abolition of the death penalty. Initial signatories include writer and journalist Ahdaf Soueif, human rights lawyers Gamal Eid and Emad Mubarak, writer and director Khaled al-Khamissi, and political figure Amr Hamzawy and 164 others. The statement and the anti-death penalty campaign was launched in April in response to the mass death sentences imposed by a court in Minya after a trial condemned by Amnesty International as “grossly unfair”. On 5 June Egypt Solidarity Initiative supporters presented a 5,600 signature international statement to the Egyptian Embassy in London condemning these verdicts. We are a group of Egyptian men and women who came together recently because we are shocked by the rise of a sociopathic attitude towards the right to life in Egypt, and the escalating pace of death sentences in the country. The death sentence is promoted as a practical solution to our problems although it represents an assault on first and most sacred human rights – the right to life – feeding an atmosphere of intimidation and the escalation of violence and counter-violence. Our group met recently in Cairo with one goal which is to work for the abolition of the death penalty in Egypt, in order to catch up with those countries which have already abolished it in law or in practice, including many Arab and Islamic countries. According to Amnesty International around two thirds of states worldwide have abolished the death penalty. When we met, the question which preoccupied us was “who has the right to take away life, other than the giver of life?” The supreme values and principles of all religions, laws and covenants on heaven and earth agree on the priority of protecting the life of human beings, which this punishment destroys. The bitter period through which this country is passing is one of the factors which has stirred the consciences of the signatories, in particular the clear deterioration in the justice and legal system in Egypt where it is questionable to what extent legal rulings are based on the principles of natural justice and standards of evidence free of abuse and coercion. The escalating spread of torture and its systematic use by those in power in Egypt as well as the continued reliance on confessions as ‘evidence’ of crimes and the repeated use of confessions extracted under torture in many cases increases the concerns of the signatories to this statement as the death penalty cannot be undone. Prison sentences can be reduced and those found to be innocent can be freed and fines can be cancelled, but execution is irreversible. Not only does this risk the execution of innocent people, but it may also leave the perpetrator free to threaten the community. For all these reasons the signatories to this statement call on the responsible authorities in Egypt to suspend the implementation of all death sentences and to refrain from issuing any new death sentences until we have engaged in a discussion across society on the problems of the death penalty. The signatories also call on all those concerned by this issue to open a discussion on the subject in order to protect Egyptians’ right to life. Writer and journalist Ahdaf Soueif, human rights lawyers Gamal Eid and Emad Mubarak, writer and director Khaled al-Khamissi, and political figure Amr Hamzawy and 164 other signatories. Reblogged this on From the Desert to the Deep Blue Sea ….